Recent research shows that Vitamin D—the "sunshine vitamin"—offers a multitude of benefits including supporting healthy heart function, immune and bone health. But, up to 80% of Americans may have insufficient levels of this essential nutrient. Supplemental vitamin D is clinically supported and proven to significantly raise blood levels of vitamin D.
Get the answer with Vitamin D-ology™, a new online quiz developed by Shaklee Scientists. Based on the answers to 8 simple questions, the Vitamin D quiz will quickly calculate the Shaklee Health Sciences recommended level of Vitamin D. Take the Quiz Now! Shaklee's Vita-D3 is the culmination of recent scientific research including two industry-leading Shaklee vitamin D studies. Plus, Shaklee Vita-D3 is subjected to over 300 quality tests to guarantee product purity. Our vitamin D supplement contains 1,000 IU of high potency vitamin D3, the most potent form of vitamin D.
* Have darker skin pigmentation. 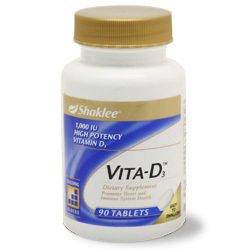 Shaklee's Vita-D3 is tested for purity and potency, is Star-K kosher certified and is Gluten Free. It contains high potency vitamin D3 and is based on cutting-edge nutrition science.